While making meatballs with lean ground beef is one way to cut fat and calories, substituting ground chicken for beef is another option. In fact, if you are looking to cut red meat from your diet, ground chicken breast or low-fat ground chicken is a healthy alternative. 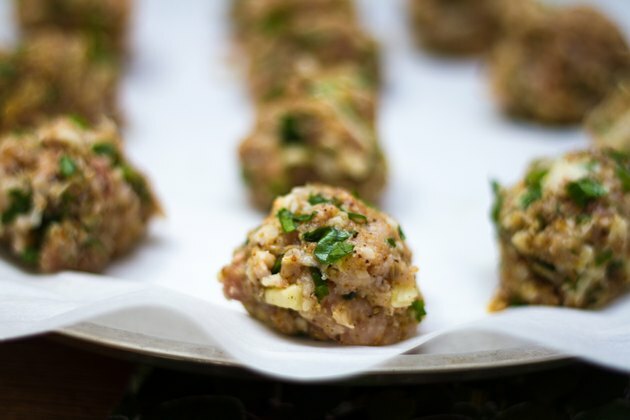 Chicken meatballs cook up just as easily as those made from ground beef, and although the taste is not identical, a healthier meatball is certainly worth giving a try. Preheat your oven to 350 degrees Fahrenheit. Place the ground chicken in a large mixing bowl. Place the ground chicken in a large mixing bowl. Crack the egg and add it along with the breadcrumbs to the ground chicken. Add the milk over the contents of the mixing bowl. Combine the ground chicken, egg, bread crumbs and milk using your clean hands. Squeeze and knead the meat and other ingredients until they are evenly distributed. Form the combined ingredients into 1-inch round balls. Place each chicken meatball on a baking sheet coated lightly with cooking spray. Remove the baking tray from the oven after cooking. Serve the meatballs alone or with salad, or add them to your favorite recipes. Enhance the taste of your chicken meatballs by adding your favorite seasonings. Adding salt, pepper, garlic, onions, parsley or shredded cheese to taste will enhance the flavors of the ground chicken. Substitute 1/2 cup of egg substitute for the whole egg to make a even healthier meatball. Check the label before purchasing ground chicken. If the label doesn’t state that the chicken is ground from breast meat or that it is low-fat, it may contain just as much fat and calories as ground round. This is usually because it contains dark meat and skin.